Yet another fabulous Disney event I wanted to share with you as a member of the Guru Travel Team ~ The Epcot International Flower and Garden Festival 2015. This event is definitely on my Disney Bucket List, how about you? You can delight in a dazzling array of Disney-themed topiaries, including a new Disney character topiary saluting the blockbuster animated film, “Frozen.” Plus, new Chip and Dale topiaries will star in two whimsical Epcot front-entrance “Goofy About Spring” floral vignettes. Eleven Outdoor Kitchens with “grow your own” gardens will tempt your taste buds with sweet and savory bites. The new Botanas Botánico Outdoor Kitchen between the France and Morocco pavilions will showcase treats like Cachapas with Farmer’s Cheese, a sweet yellow corn pancake, and Seafood Ceviche with shrimp, scallops and grouper with mango and avocado. Your Clients can sip the new La Tizana, a non-alcoholic punch finished with fresh fruit that can become an adult beverage with a splash of Santa Teresa RHUM Orange Liqueur. Over at the America Gardens Theatre, the Garden Rocks Concert Series will keep crowds rockin’ every Friday, Saturday and Sunday. Little River Band, Pablo Cruise, Gin Blossoms, and Village People join the lineup of top bands representing four decades of pop music. 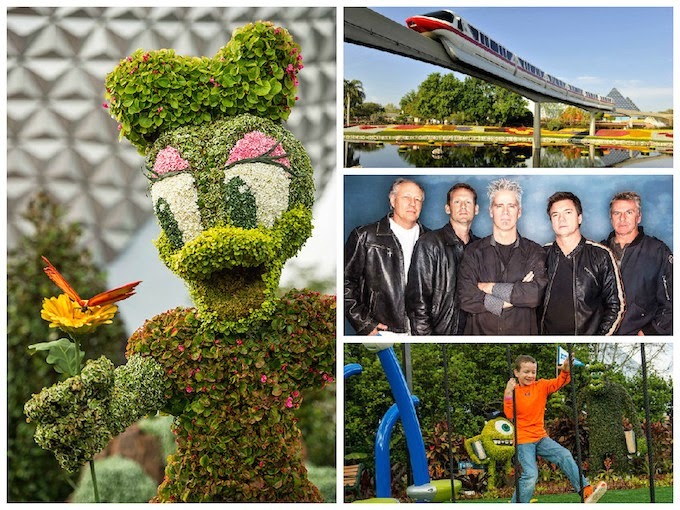 Plus, each weekend, Disney gardeners will lead how-to Gardening Seminars and workshops at the Festival Center. You can also discover magical gardens and interactive exhibits throughout the park. A new Healing & Health Garden near The Land pavilion in Future World will display ancient medicinal plants including garlic, aloe, chamomile, fennel, mint and others. In the United Kingdom pavilion, a new Shakespeare Garden will feature roses to represent “Romeo and Juliet,” rosemary from “Hamlet,” lavender from “The Winter’s Tale” and more. Plus, the Butterflies on the Go exhibit will follow the Monarch butterfly’s epic journey across the continent. Young Guests can clamber around play gardens featuring state-of-the-art climbing equipment and hands-on activities in Mike & Sulley’s Monstrous Garden and Cactus Road Rally Garden with Mater and Lightning McQueen topiaries. And, when the sun sets, illuminated topiary and play gardens will glow brightly for an after-dark festival experience. There’s something for everyone at the 22nd Epcot International Flower & Garden Festival! I would love to help you plan your Walt Disney World vacation to attend this amazing event! Contact me today for your free, no obligation quote ~ donnakay@thewdwguru.com or 877-825-6146 ext 706.